Recommended for: Chablis, Hermitage (white) and made from grape varieties such as Chenin Blanc, Aligote, Chardonnay, Albarino, Pinot (Blanc, Grigio, Gris) Viognier. Same style glass as the 6416/5 above, but lower price! Price indicated here is for set of 8. Recommended for Gamay, Barbaresco, Barolo, Burgundy (red), Barbera, Pinot Noir, Nebbiolo. Recommended for: Riesling, Gruner Veltliner, Chianti, Montepulciano, Dolcetto, Nebbiolo, Bardolino, Sangiovese, Zinfandel. Recommended for Sauvignon blanc, Semillon, Blanc fume, Rotgipfler, Sancerre, Fume blanc, Spatrot-Rotgipfler, Zierfandler. Also suitable for sweet white wines such as Sauternes, Tokaji, Beerenauslese, Icewines. Recommended for Tawny Port and Vintage Port. Recommended for Single Malt Whisky, Malt Whisky, Whisky. Introduced in 1986, Vinum was the first machine-made series of glasses in history to be based exclusively on the characteristics of quality, reasonably price and wide distribution. As you may already be aware, Riedel's Vinum has had a huge and long lasting impact on the world's wine glass culture. These glasses prove that the pleasure of consuming wine starts with the glass. The Vinum collection was developed by Georg Riedel based on his belief that the content commands the shape. 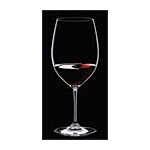 Vinum Series by Riedel is available for shipping throughout the USA and Canada.